Starwood Hotels and Resorts Worldwide, Inc. (NYSE:HOT) recently launched its 'Eternal Summers' promotion, which offers travel deals of up to 30% on hotel rooms at Sheraton, Westin, W Hotels, St. Regis, Le Méridien, Four Points by Sheraton, and The Luxury Collection. To qualify, travellers simply have to stay for two or more nights at one of the hundreds of hotels and resorts throughout Europe, Africa and the Middle East, belonging to the company's portfolio of distinctive and compelling brands. These travel deals on hotel rooms are available for stays up to September 30, 2009 and bookings must be made prior to July 31, 2009. Guests who book at one of Starwood's city hotels can save 20% if they stay for two nights, or as much as 30% for visits lasting three or more nights. A three-night stay at one of Starwood's resorts (be it for golf, beach or spa), meanwhile, qualifies for a 20% saving, rising to 30% for bookings of five nights or more. Eternal Summers bookings must be made online via http://eternalsummers.com, where travellers can also find the terms & conditions of the promotion. In addition, existing and new members of the Starwood Preferred Guest® programme (SPG) qualify for an extra bonus. With every two Eternal Summer nights booked, they will also receive one free weekend night (Friday, Saturday or Sunday). The nights are redeemable without blackout dates through the end of September 2009. Travellers can visit https://www.spgpromos.com/weekends/ to register for this hotel promotion and enroll in the programme. Some of the stunning hotels and resorts taking part in both of these unique hotel promotions include the St. Regis Grand Hotel in Rome, the brand new W Doha Hotel & Residences, the first W hotel in the Middle East, and the W Istanbul, which is the first in Europe. Guests can also experience the newly rebranded The Westin Grand Munich Arabellapark, the recently opened Sheraton Prague Charles Square and the Grand Hotel, a Luxury Collection Hotel in Florence. Or they can save on both leisure and business stays in Mauritius at Le Méridien Ile Maurice or the Four Points by Sheraton Cyber City scheduled to open in early July. The SPG programme's breakthrough policy of No Blackout Dates at the world's most sought after collection of hotels, reinvented the hospitality loyalty programme when it launched in 1999. By creating a programme centered on its members, SPG has developed the most passionate and knowledgeable membership base in the hotel loyalty space. Through its use of new technologies and innovative channels such as SPG.com, SPG.com/flights, thelobby.com, SPG Check-In, and others, SPG continues to innovate and lead the industry. By offering No Blackouts on standard rooms at more than 875 properties, No Blackouts on hundreds of airlines, and once in a lifetime experiences available through SPG Moments, the programme has proven to be a big draw for the world's most frequent travellers, and a significant competitive advantage for Starwood. For more information, please visit Starwood Preferred Guest or call (877) - STARWOOD. Starwood Hotels & Resorts Worldwide, Inc. is one of the leading hotel and leisure companies in the world with more than 960 properties in approximately 97 countries and 145,000 employees at its owned and managed properties. Starwood Hotels is a fully integrated owner, operator and franchisor of hotels, resorts and residences with the following internationally renowned brands: St. Regis®, The Luxury Collection®, W®, Westin®, Le Méridien®, Sheraton®, Four Points® by Sheraton, and the recently launched AloftSM, and ElementSM. Starwood Hotels also owns Starwood Vacation Ownership, Inc., one of the premier developers and operators of high quality vacation interval ownership resorts. 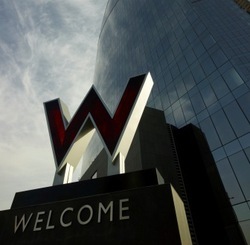 For more information, please visit StarwoodHotels.com.